Making our triumphant return to the Sonic news scene, and in attempts to quickly catch up to the current reports, this post will be covering September through December 2018. So prepare for a blue blur of stats and graphs! Starting with September, we saw the release of issue #9! 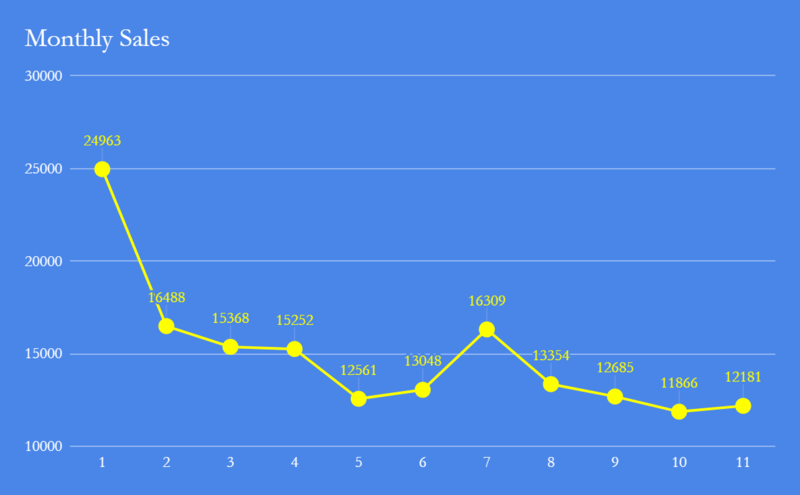 Unfortunately, despite all the build up leading into the final arc of the book’s first year, issue #9 marked the lowest amount of orders to date. With 12,685 copies ordered, this marked the second month of decreasing orders since July’s better than average numbers. Nonetheless, there was just over a 5% drop from August to September and a 11% drop from July‘s stellar sales. Overall, this is well within the normal fluctuations one might expect to see in sales, and average sales held at a solid 14,454 orders per month on average. This placed it well below the average sales numbers by 12%. Moreover, despite the drop, it still stood out as IDW’s #2 book for the month, though trailing behind Rick & Morty vs. Dungeon & Dragons by approximately 7,000 copies. Unsurprisingly amongst Sonic comics, issue #9 was unable to make the all-time Top 10 chart which remained unchanged for the first time since March, making issue #5 & 9 the only IDW books not to be on the chart. Additionally, Sonic the Hedgehog Vol. 1: Fallout! received an additional 265 orders indicating continued interested in the series as a whole! October marked the 3rd month of decreasing orders and marks the current low point for the series. Issue #10 only garnered 11,866 orders, down 6.5% from September, and a significant 16.5% since July. It is unclear, exactly what caused this drop in performance. Overall, October was a good month for comics, with no major releases distracting from potential sales, and Indie books showing higher than normal sales. Issue #10 sold below the books average of 14,104 by 16%. Within IDW, this dropped Sonic down the list behind multiple issues of Arkham Dreams and Tales from Darth Vader’s Castle, but generally remained their top selling ongoing series. Like #9 before it, issue #10 did not have notable enough sales to make the all-time Top 10 List of Sonic comics either. Thankfully, the 3 month decline was broken in November, with orders surpassing October, but not quite matching September. With 12,181 copies ordered, issue #11 did 3.5% better than October, and only 14% lower than July. A modest improvement, but a step in the right direction. However, the book’s average monthly sales did fall below 14,000 to 13,929 for the first time in November, and Issue #11 sold 12.5% below that average, itself. Sonic moved back towards the top of the IDW list ahead of all other ongoing series, though it too was not able to break into the all-time Top 10 Sonic list. The last trimester of the year, sans December since issue #12 was pushed back into January, saw less than ideal numbers. However, we should temper our assessment with the relative infancy of the series. While we have seen the average consistently drop since release, this is to be expected thanks to the stupendous launch numbers from April. Given one more issue to round out the first full year, we can establish a solid standard to compare sales going into this second year. Bar some cataclysmically low numbers for issue #12, which as the final of such an epic arc seems highly unlikely, we can expect the average to hold well above 13,000, a very respectable number. April’s sky high sales will pad it for some time to come, but to maintain such an average in the long run will require some consistency. Year to date, the series has garnered 153,218 orders. Please remember that this only represents orders from retailers though Diamond. It does not include retailer incentives or digital sales. So in reality, these number are likely significantly higher. Overall, it is safe to say that the book is still going strong despite this dip, and is by and far one of IDW’s top performers, showing up at the top of their charts month after month. January promises the conclusion of this exciting first story, and the beginning of another, along with an expansion of the IDW universe with its first annual and the announcement of a Tangle & Whisper mini-series! It will be exciting to see how these popular break-out characters perform in their own title! Thanks for reading and stayed tuned, there is much more to come! If your statistical itch has not been scratched, fear not, numbers for issues #12 & 13 should not be far off. Numbers should be released within the week! In the meantime, keep an eye out for more reviews, previews, and discussions of everything IDW Sonic, here at Sonic Source! Next Sonic the Hedgehog Vol. 2 On Sale! I hope the Tangle & Whisper miniseries sells well, it would mean more miniseries or even a Sonic Universe tie-in. I definitely hope they can expand the line into other series.